snowdeal.org > ex machina: the eric update - day 1182: odin rides a bike! the eric update - day 1182: odin rides a bike! some might recall that we put off buying a bicycle for odin because he was too big for a 12-inch bike and a little too small for a 16 inch bike and we didn't want to buy a small bike that he'd outgrow in a single summer. but a neighborhood friend let him borrow her bike so he could perfect pedalling and ( perhaps more importantly ) braking. 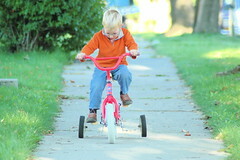 after some initial skepticism that riding a bicyle would be any fun, he hopped on and started tearing around the block! i wonder if he's been sneaking out at night and riding bikes with neighborhood kids because he instantly grasped the concept that pushing the pedals backwards slowed him down. i strongly suspect that early next summer he'll be tooling around in a new, sporty bike perhaps even sans training wheels.